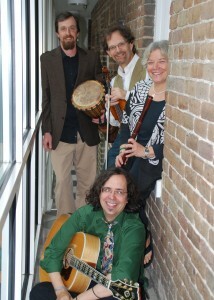 Mithril is one of the most sought after Celtic/World music groups on the concert series scene. The band’s unique progressive style has its roots in traditional Celtic music but moves far beyond that, weaving such diverse influences as American folk, classical, and Middle Eastern melodies into their full tapestry of sound. The four musicians – Andra Bohnet, Tom Morley, Ben Harper, and Sam Gaston – perform their all-instrumental shows on a wide array of traditional instruments, including Irish flute, whistle, fife, Celtic harp, fiddle, bouzouki, mandolin, guitar and world percussion, playing with the precision of their classical training and the enthusiasm that springs from their love of the music. In over a dozen years together, Mithril has been featured on arts and concert series and as guest artists on symphony pops concerts throughout the US. In addition to their concert appearances, Mithril has recorded six CDs which have been featured on radio stations throughout the U.S. and Canada and have been downloaded throughout the world. Visit www.mithril.us to learn more. 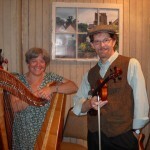 Banna de dhá features the duo of Tom Morley on fiddle and Hazel Ketchum on guitar and vocals. The name is a loose ‘American meets Irish’ translation for “band of two,” but the musical whole is greater than the sum of its parts. Taking their inspiration from great Irish Traditional music duos (such as Martin Hayes and Dennis Cahill), banna de dhá uses the vast repertoire of Irish instrumental and vocal music as their starting point, adding music from other folk traditions, while keeping it all fresh and unique with unexpected improvisational turns. The dynamic musical connection and creativity between the two musicians in banna de dhá assure audiences that they’ll take a unique trip through a Celtic landscape together, one that will never be repeated exactly the same way twice. Learn more about Banna de dhá here. During the past decade the Silverwood Quartet has brought their fresh and innovative approach to chamber music to enthusiastic audiences throughout the United States and Japan. 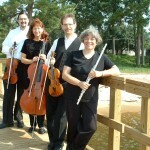 Although their standard instrumentation is flute, violin, viola, and cello, a typical performance by this versatile ensemble will include a kaliedescope of instrumental colors. A variety of flutes, whistles and recorders, Celtic Harp, mandolin, guitar, and an array of percussion instruments could be featured in one of Silverwood’s unique arrangements. Add to that an eclectic mix of musical styles from around the world and across the centuries played with artistry and passion and you have an unforgettable concert experience that will move and delight one and all! Members include: Andra Bohnet (flute), Tom Morley (violin), Jonathan Clark (viola) and Barbara Gabriel (cello). In addition to their concert appearances, the ensemble has recorded five CDs which have been featured on public radio stations throughout the U.S. and have been downloaded throughout the world. The Mithril Duo features Tom Morley (fiddle, guitar, mandolin, accordion) and Andra Bohnet (Celtic Harp, Irish flute, whistle). They feature the ‘softer side’ of the Celtic music spectrum, with O’Carolan ‘planxty’ tunes, slow airs and classic, beautiful melodies from Ireland, Scotland and beyond. But that doesn’t mean they might not kick it up now and again with jigs and reels as well! 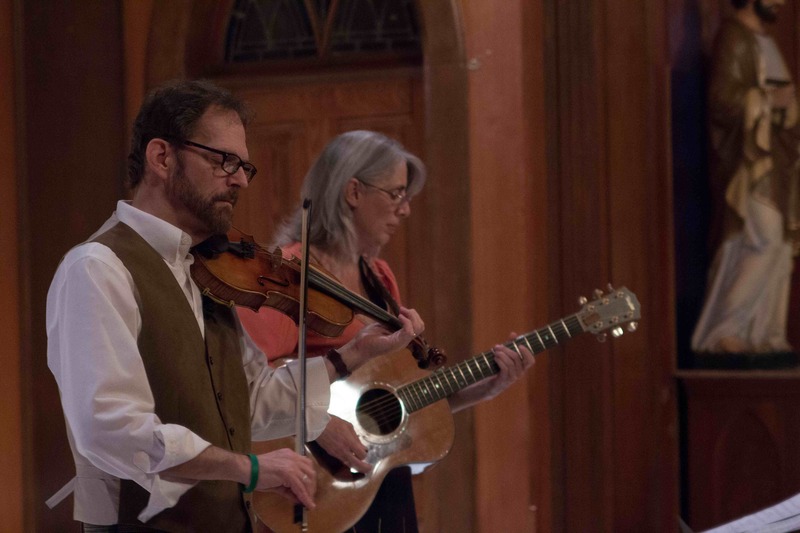 Tom & Andra have been featured on a number of music concert series (and have performed for countless weddings and receptions as well). The duo is currently working on a ‘Celtic Baroque’ recording project focusing on the music of Turlough O’Carolan. Contact me any time to book me or one of my groups, by email (flyingfrog@aol.com) or by phone (251-928-0987).